My world just got bigger! My poor husband has put up with my agonisingly slow attempts at walking for months now, walking patiently by my side and supporting me when I inevitably needed it. We’ve passed up chances to go to places and do things that last year we would have jumped at doing. We were no longer going to places where I would need to walk any further than from, say, the car to the house. Shopping had become almost impossible, often with me (especially at the end of the working day) having to sit down at regular intervals around whichever store we were in or standing, stork-like, when choosing things from shelves! My world, our world, had shrunk beyond recognition. I was doing what I had to do and sitting everything else out. We were increasingly spending more and more time apart and neither of us liked it. I had had a taste of being pushed about in a wheelchair and I hated feeling vulnerable and out of control. So I came up with a compromise; I would buy a self-propelling wheelchair, one that the occupant pushes along by hand. I’d seen a few on ebay and had done a bit of research, but decided to ask a care expert. I needed something that I could quickly and easily dismantle and put into the back of my car. The Colibri is shorter wheelbase than most and breaks down into five pieces. It fits perfectly into my car boot! I went to doctors last week to chase up my MRI scan. It’s been requested, but the waiting list is about 3 months long. It could be another month before I even get the scan, despite my doctor offering to chase it up. In the meantime I didn’t intend to carry on the way I have been. I can’t walk any distance without discomfort. I find that by the end of the day I am sore and unable to even stand for longer than a minute. I’m just about managing to get through a work day and school days have been tougher because I spend too many times getting in and out of the car with the peripatetic role I have. Cooking a meal, or standing for a shower are virtually impossible by the evening. I spent a day without pain etched on my face. I still struggled when cooking the tea; I still stood like a stork, in an effort to take weight off my left leg and leaned heavily on the worktop, but I had accomplished two other things which I had previously dreaded. 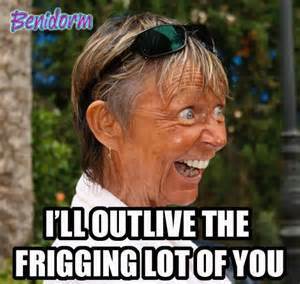 And talking of funny things, here’s a taste of Madge on Benidorm if you’ve got three minutes to spare!